Starting point: Regent Park Community Food Centre, 40 Oak Street (just east of Parliament Street). Please come around 5:45 PM, so that the tour starts promptly at 6PM. Join us for Toronto Urban Growers' final tour of the season! 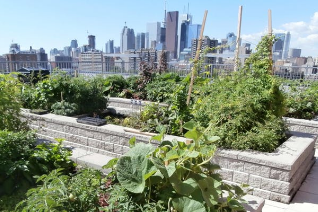 Come by after work to visit three sites where residents of Regent Park are cultivating a variety of crops, both on the ground and on the roof, right in their neighborhood. This tour will be led by the CRC Gardens Coordinator and garden volunteers. Three sites will be visited: 230 Sackville, 1 Oak, and the Regent Park Multi Garden. The tour is FREE – donations for tour site hosts are welcome.